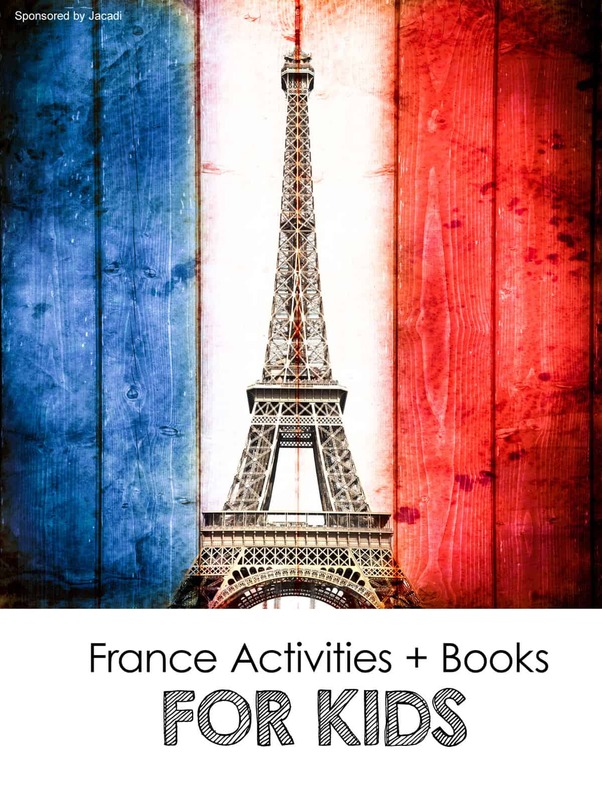 This sponsored collection of playful lessons about France is brought to you by Jacadi. You don’t need a passport to travel around the world. 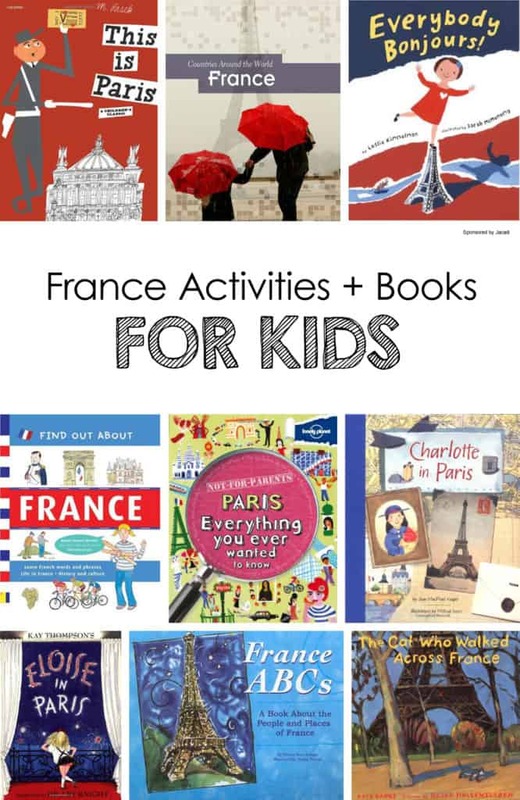 Using the activities, art projects, and books below, take your child on an adventure to France. You’ll learn about France’s history, their great artists, and of course… the city of Paris. 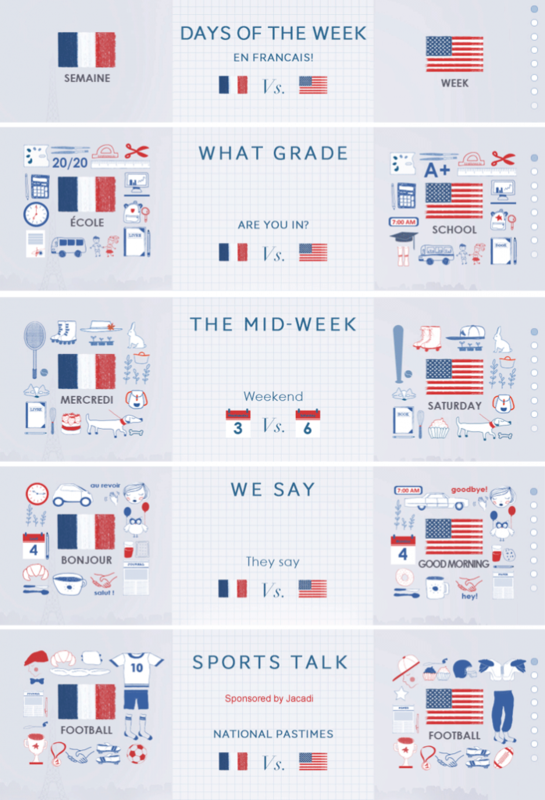 Did you know that in France kids enjoy the day off of school on Wednesday instead of Saturday? Learn more differences. Now it is time to dig into a project and get creative. 1. Build the Eiffel Tower out of LEGO, pretzels, or toothpicks. Need help getting started? Check out this toothpick construction guide. 2. Have your child create a pastel and watercolor re-creation of “Le Bassin aux nymphéas,” one of Monet’s many waterlily paintings. Not keen on paint? Check out this beautiful waterlily tissue paper craft instead. So simple and fun. 3. Have your little one color France’s flag or a map of the country. 4. 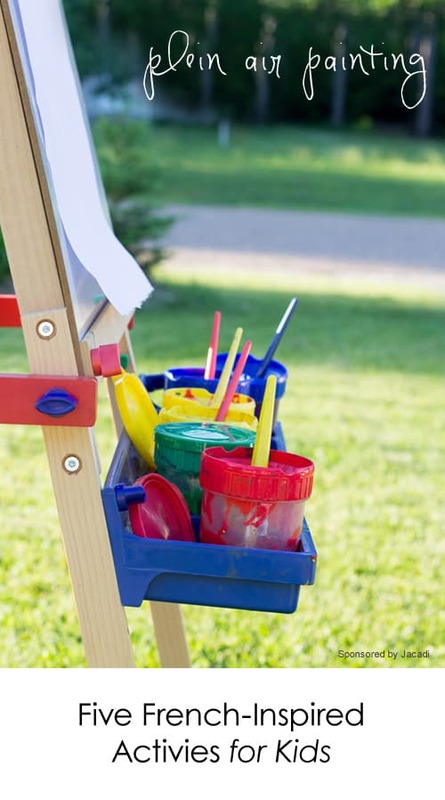 Experiment with plein air painting with your child and enjoy the breeze. 5. Share some of your favorite Degas paintings with your little one and then create a no-sew tutu together. This is London, first published in 1959, presents impressions of London with its beautiful buildings, historic monuments, bridges, parks, shops and Piccadilly Circus, black cabs, Horse Guards, and famed Underground. Sasek’s brilliant, vibrant illustrations have been meticulously preserved and remain true to his vision. With the passing of time, facts have been updated where applicable in the back of each book. On this fun and friendly tour, everybody says “Bonjour!” Whether at a soccer stadium (“players scoring”), a crêpe stand (“batter pouring”), or strolling the Champs d’ Elysee (where folks “bonjour” in every store), a little girl and her family are welcomed everywhere with the signature French greeting. Kay Thompson and Hilary Knight traveled to Paris to research the book, and the illustrations are dotted with the celebrities they knew there: Richard Avedon takes Eloise’s passport photograph; Christian Dior prods her tummy, while his young assistant, Yves Saint Laurent, looks on; Lena Horne sits at an outdoor café. If you come to Paris with Eloise you will always be glad you did. This is not a guidebook and it is definitely ‘not-for-parents’. It is the real, inside story about one of the world’s most famous cities – Paris. In this book you’ll hear fascinating tales about creepy stone gargoyles, ghostly railway stations, huge castles and amazingly pampered pets. Another great way to introduce children to different countries is FOOD. If you have any favorite French recipes for the kids to try, I’d love if you’d leave them below in the comments. Well my friends, Au Revoir! PS: Be sure to check out this playful collection of kid-friendly info! Hi! Do you know if the collection of information is still avail from Jacadi? If so, how can I find it? I was looking, bu didn’t have any luck finding it. Thank you!